Sorghum flour can be prepared in two methods. You may follow the method suitable for you. Take 1 kilogram of Sorghum millet. Dry roast Sorghum in a pan in low flame until it pops-up. Turn off the flame and let it cool completely. Grind the Sorghum in flour mill. Sift the flour if required and store it for future use. Take 1 cup of flour to make laddus. If you have store bought Sorghum flour readily available at home, take 1 cup of it and dry roast until it gives a nice aroma. Turn-off the flame and let it cool completely. Powder the Jaggery using a mixer grinder. Add the Sorghum flour into the same jar and run the mixer grinder for a minute. It helps the flour and the jaggery to mix very well. Transfer the mix to a wider bowl. Add Cardamom powder into it. Crush the roasted Chickpea gram slightly and mix it in the flour. Take either Sesame or Coconut oil in a small bowl. Heat it in low flame for 1 or 2 minutes. Turn-off the flame and add the oil in the flour bowl. Mix everything thoroughly. Take flour in small quantities and shape them into balls by holding tight in the palm. I learnt this recipe from Healthy food kitchen and customized it. Check the sweetness of the flour before pouring the oil. If required, add some more jaggery powder as per your taste. Similarly, if ball is not coming to the shape easily, add 2 or 3 more teaspoons of warm oil. Each type of oil gives its own flavour and taste. So try both types and then choose based on your likings. Using oil is strictly prohibited in Life Natural recipes. Generally, flour laddus are prepared with ghee. 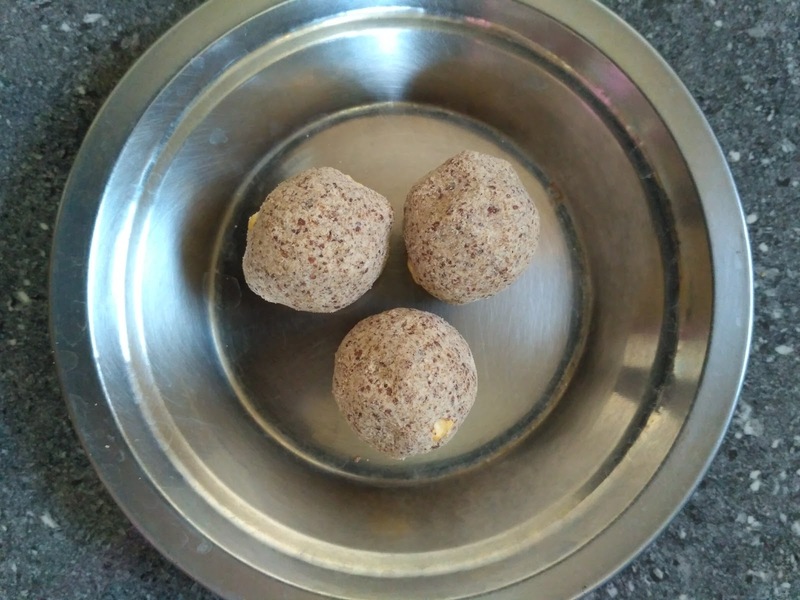 Those who would like to taste flour laddus (vegan) without ghee, oil can be used as an alternative. If anyone wants to prepare complete oil free laddus can prepare Porivilangai laddus. You can use this recipe and make laddus with Pearl (Bajra) millet and Finger (Ragi) millet.